Here is our rendition using our design program of our new Minnie Mouse Epcot themed dress/outfit. 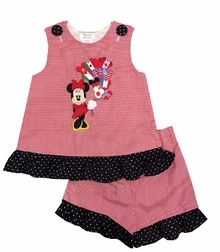 We have taken red gingham and fashioned a dress or swing top trimmed at the hem with Disney Minnie dots ribbon (red, yellow and black dots on white grosgrain ribbon), and a black with small white dots fabric ruffle. 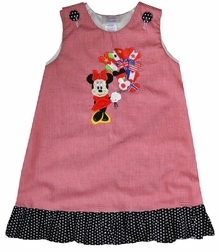 The dress/top fastens at the shoulders with dotted covered buttons. The cutest part of the outfit? Minnie Mouse is appliqued on the front and is holding several balloons representing the flags of many of the countries in Epcot!